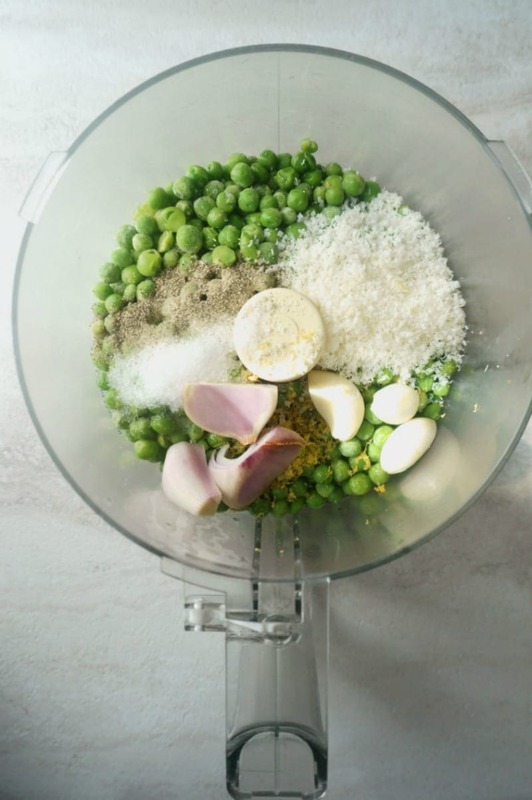 Pea Hummus: Fresh spring peas are combined with Parmesan, garlic, shallots and lemon for a fresh pesto that is perfect for topping crackers with or tossing with warm pasta. My son has a weird habit. Okay, he has lots of weird habits! But one that stands out to me weekly, is the fact that he likes to eat frozen peas. Yep, frozen peas. He loves them. And it should be noted that he hates peas when they are heated. So while the rest of my family is eating our peas cooked, like normal people, he asks for his frozen. Not worth arguing over in my book!! A frozen pea is still a pea. Now for me, I like peas in all sorts of varieties. I love them tossed with warm pasta, sauteed with pancetta, and in cold pasta salads. I also love to make a dip out of them. This is really NOT a hummus, as it is not made with Tahini or Chickpeas. Pea Hummus is a bit more like a thick pesto. So I went back and forth deciding what to call this. Pea Hummus or Pea Pesto? And ultimately, I think of dipping crackers into hummus not pesto, so that is how I settled onto hummus. However, much like a pesto, this dip would also be great tossed with pasta or served on a pizza as well. For Pea Hummus, simply place all ingredients in a food processor and pulse until combined. Add a splash of water, or stock to thin out the pea dip to the desired consistency. If you want to make this as a Pea Pesto instead of a dip, add in up to 1/3 cup olive oil into the food processor. Then serve this pesto tossed with pasta, or as a base on a pizza or as a marinade for meat. Add 1 bunch fresh mint for a fresh spin on this pea dip. Store this dip for up to 6 days in the fridge. Use fresh or frozen peas. Peas are blended together with bright herbs, olive oil, and Parmesan for a delightful pea dip. Taste and add more salt if needed--the parmesan adds quite a bit of salt already, so check before adding more than 1/2 a teaspoon. I used water in this dip to let the pea flavor shine through. Olive oil or chicken stock or even veggie stock all work well. So unique!!! What a great spring recipe! Dear Kristen, this hummus is packed with color and flavor. I would love to sample on those delicious crackers! My best friend’s daughter will also ONLY eat frozen peas. I’m so glad to read your post. I’m going to share it with her. The Hummus looks so vibrant and delicious. Can’t wait to give it a whirl. What a great idea! So perfect for spring! I love the unique twist on hummus and what a great way to sneak in some yummy green veggies!